In a randomized prospective analysis of 120 healthy volunteers, Edmiston et al found that a standardized preadmission shower regimen that includes 118 mL of aqueous chlorhexidine gluconate, 4%, per shower; a minimum of 2 sequential showers; and a 1-minute pause before rinsing results in maximal skin surface (16.5 µg/cm2) concentrations of chlorhexidine gluconate that are sufficient to inhibit or kill gram-positive or gram-negative surgical wound pathogens. It is unclear why wide variations in mortality rates exist across hospitals performing lung cancer resection. In a retrospective cohort study, Grenda et al examined rates of adherence to processes of care, incidence of complications, and failure to rescue among patients who underwent lung cancer resection at a high- or low-mortality hospital. Higher failure-to-rescue rates at high-mortality hospitals may explain the large differences between hospitals in mortality rates following lung cancer resection. There is a dearth of information explaining the underlying etiology of the variability in 30-day readmission. Using a single-center cohort of 22 559 patients undergoing major surgery, Gani et al quantify the proportion of variation attributable to factors related to patient, surgeon, and surgical specialty. Variation in readmission was overwhelmingly owing to patient-level factors while only a minority of the variation was attributable to factors at the surgical subspecialty and individual surgeon levels. The prevalence of laparoscopic sleeve gastrectomy (LSG) is increasing, yet data on its long-term effect on obesity-related comorbidities are scarce. In a retrospective analysis of a prospective cohort at a university hospital, Golomb et al collected data from all patients undergoing LSGs performed by the same team. Undergoing LSG induced efficient weight loss and a major improvement in obesity-related comorbidities, with mostly no correlation to percentage of excess weight loss. There was a significant weight regain and a decrease in remission rates of diabetes and, to a lesser extent, other comorbidities over time. The role and clinical benefit of ruptured endovascular aneurysm repair have yet to be fully elucidated. 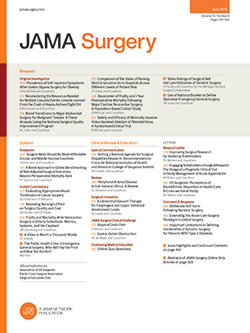 In a retrospective cohort study, Ullery and colleagues noted that the implementation of a contemporary endovascular-first protocol for the treatment of a ruptured abdominal aortic aneurysm (AAA) is associated with decreased perioperative morbidity and mortality, a higher likelihood of discharge to home, and improved long-term survival.